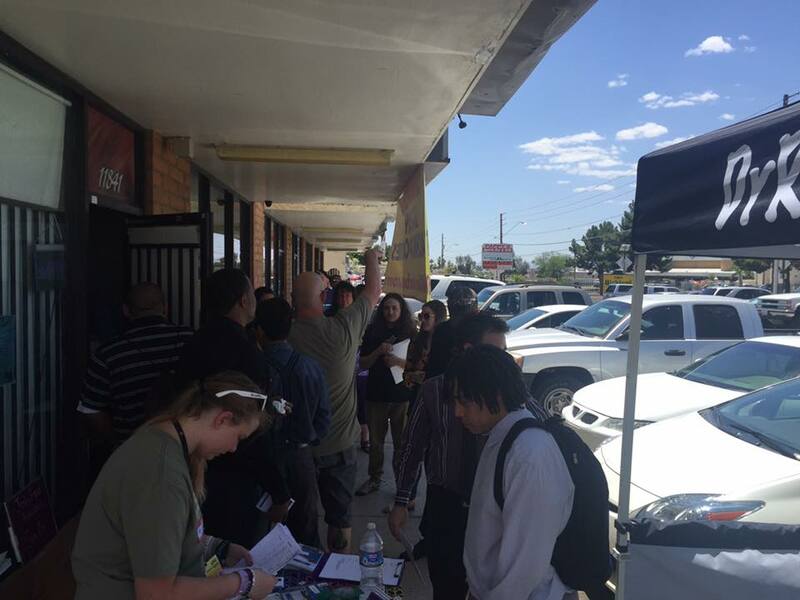 The Staff MMJ Cannabis Job Fair was held May 20th, 2016 at the Staff MMJ TerpU Campus in Phoenix. More than 300 members and job seekers attended the event. About a dozen community cannabis employers set up inside the building, including dispensaries, a security services company, edibles manufacturers, education. and legalization organizations. “We’ve seen an increase in employers who want to participate in the job fair because it’s not your typical hiring event. 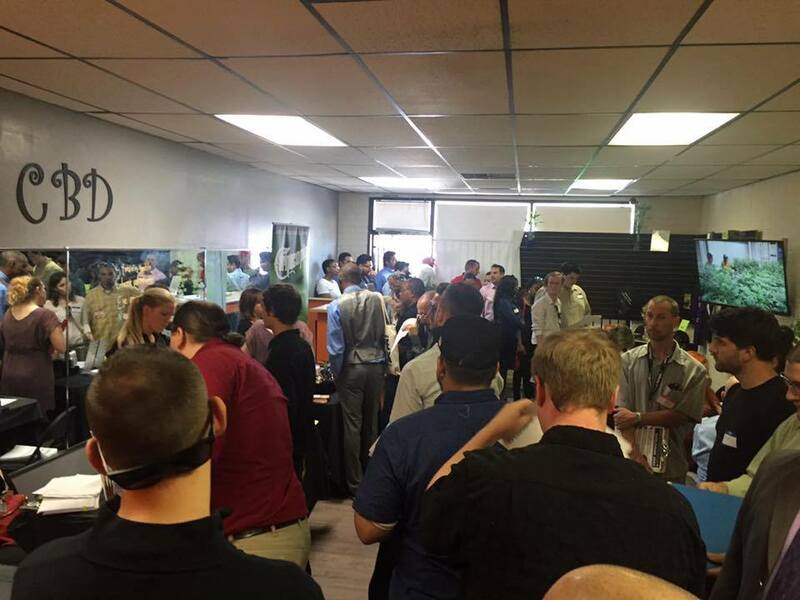 Employers had to interview at a fast pace to meet with each attendant,” said Tara Brown, Staff MMJ representative. Members of the Staff MMJ office, the directors and managers of licensed dispensaries, the local cannabis advocacy groups, and other local organizations had been meeting to develop a plan to assist interested applicants, when the idea for a 2016 job fair surfaced. The campus provided two separate rooms for applicants to meet with local cannabis companies. Those who registered ahead of time were given Fast Passes that allowed them to meet with Staff MMJ representatives and receive resume tips, interview practice, and more. Because of the popularity of the Fast Pass feature, only Fast Pass holders were able to get help with resumes and interviews. All others were able to meet with the attending companies of which included: The Holistic Center, Cornucopia Infusions, 710 Chronicle, Norml, Herbal Risings, A 2 Z Security, American Green, Jebus Glass, High Desert Healing, Nature’s AZ, and Dr. Reeferalz. Those who attended the Cannabis Job Fair had opportunities to play games, win prizes and has access to resume tips and interview practice sessions. “With fun and games outside, it was all business inside the campus,” Brown said. “We live in a medicinal state and our patients deserve the best”. Prizes were sponsored by Arizona Cannabis Society, American Green, Dos Vapes, Horizon, The Holistic Center, Safer Arizona, Herbal Risings, High Desert Healing, and El Gordo Title Loans. 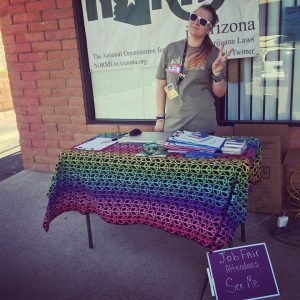 Since its launch in 2015, the Arizona Cannabis Job Fair has attracted hundreds of curious job seekers and patients alike. The idea of a Cannabis Job Fair grew out of concern for lack of information available to applicants. The 2015 job fairs were sponsored by Sun Valley Certifications, Health 4 Life Dispensary, and Hempful Farms. Security was provided by A 2 Z Security Services. For employers: If you are interested in participating in the next Staff MMJ event, please contact hired@staffmmj.com or call 602-476-8868 for additional information.